In this Hotel Hell episode, Gordon Ramsay visits River Rock Inn in Milford, Pennsylvania, bought by Ken Pisciotta two years ago but personal life is suffering, he is single and in hundreds of thousands of dollars of debt. Gordon arrives at the hotel and there is no one there to greet him at the door, he is finally greeted by Assistant Innkeeper Karen. She takes Gordon up to his room where he finds dead bugs and cockroaches in the bathroom. There is a random chair in the corner that it is the Wi-Fi hot spot for the building and Gordon attempts to watch TV but there is no reception. After failing to relax, he goes down to the dining room where Ken explains that he runs an American Bistro but the menu has dishes from all over the world. When Gordon talks to Chef Seth, he claims the menu is Ken's and doesn't want to serve it but he has no control. He returns to his room but before getting into bed he brings out the black light and finds a variety of stains and instead chooses to sleep in his sleeping bag. The next day Gordon meets with the current guests and no guest says that they would return. Gordon shows Karen and Ken the results of his black light test and the staff begin cleaning the Inn. He finds passive aggressive messages such as "If you eat these cookies, take one to your next job interview" and the staff say Ken can be demeaning, Ken apologizes and promises to change. Gordon invites Ramesh Sadhwani, the Vice President of Hotel Operations at Caesars Palace to give them a lesson in Hospitality. Karen shows that she is a natural at customer service and Ken realizes she needs to be at front of house. In order to boost Ken's confidence and to help him with his love life Gordon brings in a stylist to give Ken a makeover and Gordon takes him out into town, they meet some locals who say they will bring their single friend to the relaunch. Overnight the Inn is transformed with improvements to the rooms including new TVs, mattresses and bedding. The website has been improved and so has the Wi-Fi access. For the relaunch night, Ken's mom are brother arrive and are happy with the changes that Gordon has made. Ken is more relaxed and leaves the staff to do their jobs allowing him to mingle more with the customers including the ladies he met the evening before and their single friend. Gordon deems the relaunch a success but before he leaves he hands Ken the phone number of the single friend. Yelp reviews after the show was filmed were very mixed with regards to the food in the hotel, some diners reported long waits and problems with food, whereas Trip Advisor reviews were more positive.. A loyalty programme was introduced for regular diners at the restaurant and a new menu was introduced. They closed in December 2014 and the hotel has reopened, reverting back to the Laurel Country Inn with the previous owners, Trip Advisor reviews are mostly positive. 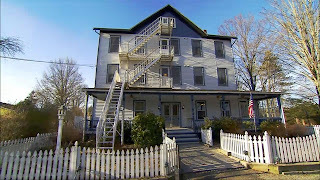 River Rock Inn aired on September 03 2012, the episode was filmed in January 2012 and is Hotel Hell season 1 episode 5.
i want to know if the owner ever went out on a date with that woman lol.